Mix the ingredients together in a big bucket or dishpan. If you make your bubble juice the day before you want to use it, you'll get bigger, stronger bubbles, but it's pretty good right away, too. Tape the plastic lid over the end of the flashlight the light shines from. Turn the flashlight on and hold it so the light shines straight up. Dip your finger in the bubble juice and wet the lid. Put a spoonful of bubble juice on the lid. With a straw, blow one big bubble to make a bubble dome that covers the whole lid. Turn off the lights and hold the flashlight so that the bottom of the bubble dome is just above your eyebrows. Watch the swirling colors. If you put the wet straw into the bubble dome and blow very gently, you can move the colors around. Watch the colors. How many do you see? If you watch a bubble for a few minutes, do the colors change? What colors do you see right before the bubble pops? Do you ever see black and white polka dots? Right before it pops, the skin of a soap bubble is only one-millionth of an inch thick! Why are soap bubbles so colorful? The colors of a soap bubble come from white light, which contains all the colors of the rainbow. When white light reflects from a soap film, some of the colors get brighter, and others disappear. You can think of light as being made up of waves—like the waves in the ocean. When scientists talk about waves, they often talk about a wave's frequency. Frequency is the number of times that a wave vibrates in a second. For ocean waves, frequency measures the number of times a passing wave makes a surfer bob up and down in a second. For light waves, frequency measures how many electromagnetic vibrations happen in a second. The frequency of a light wave determines which color light you see. Violet light, for instance, is the highest frequency light that you can see; it vibrates 723,000 times in a billionth of a second. White light is made up of light waves of many different frequencies. Two waves can be in the same place at the same time. Suppose two ocean waves of equal size meet. Each wave pushes up and down on the water in its path. Where the waves meet, there are two different forces acting on the water, one from each wave. If both waves push up on the water, the water moves twice as high as it would move if it were pushed by one wave alone. This is called constructive interference. If one wave pushes up and the other pushes down, the two pushes cancel each other and the water doesn't move at all. When this happens, it's called destructive interference. What does all this have to do with the colors of bubbles? Light waves, like water waves, can interfere with each other. A bubble film is a sort of sandwich: a layer of soap molecules, a filling of water molecules, and then another layer of soap molecules. When light waves reflecting from one layer of soap molecules meet up with light waves reflecting from the second layer of soap molecules, the two sets of waves interfere. Some waves add together, making certain frequencies or colors of light brighter. Other waves cancel each other, removing a frequency or color from the mixture. The colors that you see are what's left after the light waves interfere. They're called interference colors. The interference colors depend on how far the light waves have to travel before they meet up again--and that depends on the distance between the layers or the thickness of the soap film. Each color corresponds to a certain thickness of the soap film. By causing the liquid bubble film to flow and change in thickness, a puff of wind makes the bubble colors swirl and change. The very thinnest film—one that's only a few millionths of an inch thick—looks black because all the reflecting wavelengths of light cancel. When the soap film looks black, it's just about to pop. What's the best set-up for seeing colors in a bubble? Interference colors on a bubble look brightest when there's white light shining on the bubble and a black background behind it. The colors come from light that's reflecting from the soap film. You want to be on the same side of the bubble as the light source so that light will bounce back to your eyes. The black background keeps light that's shining through from the other side of the bubble from washing out the colors. Where else can I see shimmering colors like these? 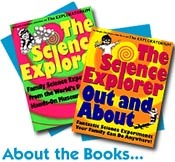 You can experiment with interference colors using the Reflecting Rainbows experiment online, or the Rainbow Prints experiment in the Science Explorer Book.